And I find it seriously profound. I’ve been feeding this little piece of the Internet with quotes and opinions for just over 4 months and in that time a pattern has Emerged – I often end up talking about perspective and trying to turn the negative into a positive, this quote is no different. 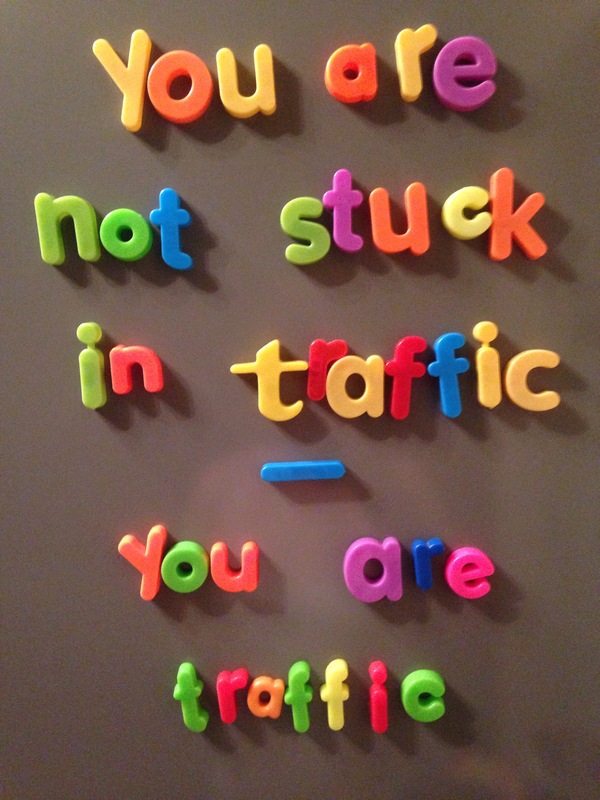 I wrote about traffic in this post and it did alter my perspective – what is the point in getting stressed when your train is delayed or your car is doing zero miles per hour thanks to some road works…however, I never thought that I was the traffic. I wonder how many times in life we are partly, if not entirely responsible for a negative situation we find ourselves in. How many times have you moaned about somebody’s behaviour – only to have done a similar thing several days earlier? If you look at yourself as the ‘traffice’ maybe it’s time we began to enjoy it a little bit more. How? Perhaps the traffic allows you to catch up with someone on your blue tooth that you haven’t seen in a while, that delayed train means you can return to your friends for that drink you didn’t think you could make, or perhaps the next time you are stuck in traffic you turn off the engine, smile at the stressed looking couple next to you, listen to a podcast, get some culture with an audio book, learn a new language or simply enjoy the silences and just be. In this crazy, fast spinning world a few minutes of peace is a gift. Make sure you are positive traffic or at least make it work for you rather than against you, after all it’s your life journey so make it work for you. Friday’s in my car are podcast times, an hour each way gives for plenty of listening and I really look forward to it. Brilliant! I will now be in ‘uninterrupted free time’ where I can sing, learn, smile, or whatevs I feel! xoxo #thesatsesh Mindset is everything!